Final version acepted: 14 December 2010. Disasters in Mexico and elsewhere are causing growing concern because of the increasing fatalities and rising economic losses. Each disaster is unique in form and intensity, since each results from an interaction of physical, biological and environmental conditions with socioeconomic, political and cultural processes; components that either individually or collectively occur at different scales. The present research considers the Sierra Norte de Puebla in terms of the evolution of economic and political components, in addition to the morphological and climatic similarities throughout the region, and a strongindigenous presence. This forms the basis for a general interpretation of disaster occurrence in this region. 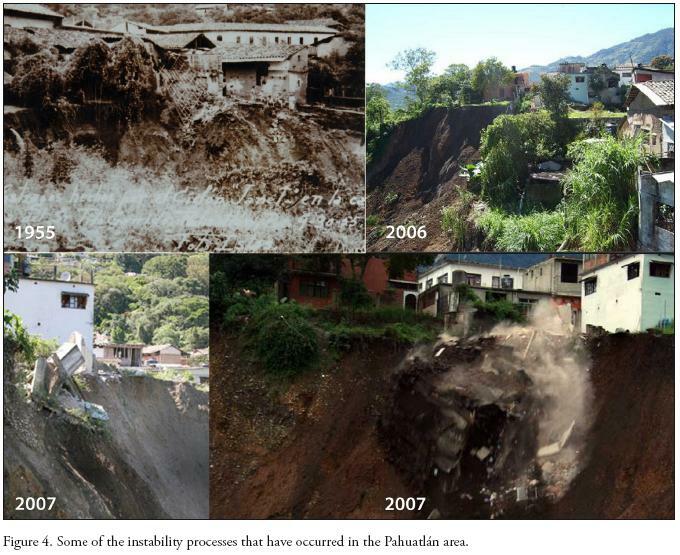 There follows an analysis of the circumstances that have led to the vulnerability of the villa of Pahuatlán to landslides; this began during the late 19th century, when the town started to consolidate in economic and urban terms through its incorporation into national and international markets. Since then, material culture and urban morphology have continued to change; for example, house construction has been a determinant factor in the degree of vulnerability of this community. This history is an integral part of the present day fragilities and deficiencies of Pahuatlán villa. Key words: Vulnerability, disasters, landslides, material culture, urban morphology, Sierra Norte de Puebla, Pahuatlán. El impacto de los desastres en México y el mundo, es una temática que ha tomado relevancia en las últimas décadas, tanto por el incremento en pérdidas humanas, como por los crecientes montos económicos de los daños materiales. Al examinar los desastres, se observa que cada evento es único en sus formas e intensidad, al ser resultado de la conjunción de condicionantes físicas, ambientales y biológicas con procesos socioeconómicos, políticos y culturales, componentes que tanto de forma individual como colectiva se manifiestan en diversas escalas. Este es un trabajo de valoración y reflexión acerca de la evolución de los componentes económicos y políticos, amén de las semejanzas estructurales y climáticas, y de la profunda pervivencia indígena de toda la Sierra Norte de Puebla, para proponer líneas generales en la interpretación de los desastres para esta región. Tomando en cuenta lo anterior, se propone en una temporalidad media, el análisis de las circunstancias que han ido constituyendo la vulnerabilidad en la villa de Pahuatlán, comenzando a partir de la segunda mitad del siglo XIX; décadas en que tuvo lugar −aunque en detrimento de algunas de sus centenarias comunidades indígenas−, la consolidación económica y urbana de la actual cabecera municipal, como consecuencia de su incorporación a los mercados nacional e internacional. Desde entonces, han sido constantes las alteraciones a la cultura material local y las transformaciones en la morfología urbana, por lo que el tipo de edificación ha resultado determinante en el grado de vulnerabilidad característica de esta comunidad. Una vez analizadas las inercias históricas de la villa de Pahuatlán, se propone reconocer su vinculación y grado de influencia sobre las fragilidades, deficiencias y limitantes observadas en la actualidad. Palabras clave: Vulnerabilidad, desastres, deslizamientos de ladera, cultura material, morfología urbana, Sierra Norte de Puebla, Pahuatlán. In recent decades, growing numbers of people throughout the world have been affected by some kind of threat of disastrous consequences; according to the EMDAT system of the University of Louvain, Belgium, in 2008 approximately 235 000 people in the world died, 214 million were affected and the economic loss was close to $US 190 billion (Rodríguez et al., 2009:1). From this, two important conclusions can be drawn: first, a large number of people around the world are in areas of high risk, where threats from physical and biological phenomena are common; second, less obviously, many people are highly vulnerable to these phenomena that recur over relatively short periods of time, and also to the threats to society generated by international structuring of the market and finances and by the role given to a community in national, regional and local terms. In a world that aspires to better standards of living, the current figures on disasters are unacceptable and unsustainable. Disasters have become a central and critical problem in economics. Statistical data show the growing economic impact of disasters, with significant damage to production systems and capital that requires larger investments in reconstruction and recuperation. A disaster is not only a physical or biological event, it is the alteration or disruption of a social body that may achieve an autonomous recovery or may lack the means to do so, according to the dynamics of its infrastructures, productive methods, territorial structure, identity and cultural parameters; the outcome is strongly influenced by the disposition of the social and political leaders (Blaikie et al., 1996:911; WilchesChaux, 1998:910). The occurrence of a disaster can be divided into two stages. The first is due to any kind of threat, physical, biological or anthropogenic, and this is related to the vulnerability created by the society itself. Unique events will then emerge from the conjunction of threat and vulnerability, events that affect and destabilize a society, and this is known as risk and is the second stage (Oliver, 1994:25; Lavell, 1996:13; Macías, 1999:29). A disaster is the palpable and visible manifestation of an inadequate relationship with the environment, a situation linked to and promoted by unsolved problems of the prevailing economic model and political system. Thus, the existence of vulnerability is one more incompatibility within the socioeconomic system. Because of this, it is essential to consider risk as a social construction with social production relations defining the degree of vulnerability demonstrated by a certain space (Wijkman and Timberlake, 1984; Lavell, 1996:27). There is extensive literature regarding the social construction of risk or inferring it, and it seems to have become the preponderant vision in the analysis of disasters. Among the authors who have suggested that disasters are shaped by different types of social relations of production that are fundamental in the effects of a threat, the following are of particular interest here: Hewitt (1997); Mansilla (1996); Lavell (2001); Calderón (2001); Olcina and Ayala (2002) and Birkmann (2006). Hence, disasters and vulnerability are social constructions dominated by the combined action of socioeconomic, political and cultural conditions on one hand, and physical and biological conditions on the other, all acting on different scales. Although the constitution and organization of a region are beyond the scope of this study, it is relevant here to acknowledge the close link between the physical and biological characteristics of the largescale relief and the cultural and socioeconomic constitution of a region. At the regional scale, disaster and vulnerability have a common background in terms of culture, socioeconomics and politics, whereas it is at the local scale that inconsistencies arise in the way a space has been occupied, and this allows the driving forces in the formation of risk and vulnerability to be identified. Initially, studies of disasters focused on understanding natural threats as the main factors in their occurrence. Later, disasters started to be examined through the concept of risk along with threat and vulnerability; it was after the International Decade for Natural Disaster Reduction 19902000 (IDNDR) that disasters were recognized as originating in socioeconomic circumstances, and studies of disasters turned to the analysis of vulnerability. Thus, disasters are failures within the economic systems, breakdowns surpassing the material capacity of the population to absorb, mitigate or avoid them. Because of this, disasters are ingrained in social change and development patterns, a preexistent product of the society before the impact, and the foretaste of more and worse disasters to come (Quarantelli, 1996). Hence, disasters are analyzed more from the social point of view, giving priority to vulnerability but not neglecting threats per se. Arguments that consider disasters to be exceptional and unexpected events and attributable exclusively to the environment create an aseptic and nonideological discourse that primarily intends to delegitimize the claims and organizational alternatives of disaster victims; these victims can then be blamed for occupying the land on an irregular basis or for overexploiting resources and thereby increasing the vulnerability of their surroundings. This standpoint assigns no responsibility for the incidents to the socioeconomic or political systems. In opposition, the view outlined in this paper considers that the proliferation of disasters is a direct consequence of the steady increase in number of vulnerable individuals. Away from the social sciences, the concept of vulnerability had its origin in the field of engineering and among developers of public works, national or regional governments, and international institutions. The infrastructure that had been created was threatened by the low resistance of the technological systems to disasters. Only the environment and the engineering works were examined in considering vulnerability. Also, social science that was dominated by the positivist or Marxist schools was somewhat limited in its conceptual ability to approach and analyze such a complex topic as vulnerability and disasters; these issues were more completely and successfully dealt with by the social sciences after the reflections and input that were contributed by the ‘spacialization' of social thinking and by the ‘cultural turn' (Fernández, 2006). Among the paradigms of these new contributions, it becomes crucial to understand how society and environment interact in the occupation of the space and the organization of the territory. Hence, the concept of vulnerability has belonged in the social sciences only since the final decades of the 20th century, a period during which epistemological proposals from outside the traditional centers of knowledge have been gaining ground. The growing importance of these newly emerging knowledge centers is relevant for the whole of science, but is crucial for an adequate analysis and interpretation of vulnerability and disasters, given the national, provincial, regional, municipal and local particularities in socioeconomic, political and cultural terms. Therefore, the concept of vulnerability derived from an essentially physical and biological point of view widens its horizons of analysis and prognosis through the inclusion of cultural, socioeconomic and political aspects; it is centered on socioeconomic conditions and cultural diversity, paying special attention to inequality, social exclusion and poverty as enhancers of vulnerability and vehicles for the occurrence of a disaster. In its widest sense, the study of vulnerability has diverse aspects. Two of these are of particular interest. First, disasters are seen as failures in power relationships within a political and social body; these failures become disasters when confronted by the inconsistencies inherent in an economic and political assemblage (Lavell, 2001). Secondly, a study of daily life traces how, day after day, the most unprotected sectors of society store risks that will encourage the incidence of a disaster. This is how a disaster stops being unusual and becomes something common, an unsolved problem of development policies (Sanahuja, 2001). The concept of vulnerability is nowadays the consequence of a detailed assessment that has differentiated among all strata and groups in society, given that inequality in the access to decent and sustainable goods and services in each of the communities under scrutiny is one of the main indicators of the degree of vulnerability. This dynamic takes place through events, well defined in their spatial and temporal ranges, within the assemblage of social relations and individual behaviors (Blaikie et al., 1996:14; Pliego, 1994:27). The following three aspects of vulnerability are noteworthy: a) as a preexisting condition of a certain biophysical space; b) as a product of society, emphasizing its formation and persistence in a specific historical and economic setting; c) under analysis that focuses on politics and political power and the way those are conceived and experienced by different social classes (Blaikie et al., 1996:1416; Cutter et al., 2003:243; Turner et al., 2003:15). It is also essential to take into account scales, nuances, and identities in order to visualize extremes and intermediate situations in societies that one way or another are vulnerable in their totality. Our view is that vulnerability arises through experiences and not through abstract logic, favoring change, the recognition of contradictions, multiple perspectives and the search for an intermediate solution between opposite proposals. Vulnerability is the condition of being susceptible to harm, so it is a concept that expresses the state of an organism or a society with weak spots or fragilities in the face of disasters (Bisogno, 1981; Cardona, 2001:11; Calderón, 2001:1415). Vulnerability, nowadays, is the prime reason for directing international, national and local efforts to counter the effects of threats (Cutter, 1996:529530; Cardona, 2001:180; Birkmann, 2006:11). It is at the same time an essential concept for the study of disasters and a starting point for the development of mitigation strategies at various scales. It is a theoretical and operational principle in which cultural, socioeconomic and political determinants interact in the face of the potential dangers of a hazard, a threat that has emerged from the dynamics of concrete spaces and timescales, on which is formed what we call vulnerability's structure: a complex framework of physical, biological and human components behaving and interacting in diverse ways. This structure is revealed in two fields of knowledge; the first, from the evolution of social processes, a dynamic marked by continuities and fractures in cultural, socioeconomic and political terms; the second, through contradictions based on the environment as a consequence of human activities. Vulnerability is the result of multiple causes that can be divided into three groups of greater or smaller influence according to the characteristics of the society under observation: a) longduration processes that created the cultural patterns and the body of the society; b) the historical stages of the society; and c) contemporaneous economic and political practices. There are authors who summarize the origin of vulnerability as the assignment and distribution of resources (Blaikie et al., 1996:5255; Wisner, 2001); this viewpoint can be enriched if we follow Wallerstein (1999), who appraised the role played by great areas of the world, their nations, regions and localities within the World System, in order to have a historical perspective on the assignation, control and distribution of resources, particularly during the past five hundred years. This analytical approach to vulnerability, manifest in concrete space and time, is complemented by scalar exercises that focus on the degree of influence, over the studied territories, of the international, national, regional or local driving forces and the intensity of interaction among them. In an ascending scalar exercise, once the characteristics of the national economic model and political system have been appraised, we must focus on a regional analysis, a range that reveals how historical stages and cultural, economic and political patterns arise and interact, thereby sharing familiar attributes that help to define vulnerability in time and space. In the present study, the region is the Sierra Norte de Puebla; isolated for centuries, it is the realm of hundreds of ancient Indian communities and tens of mestizo towns, most of them formed after the mid 19th century. All these settlements are on lands with similar geological, geomorphological and climatic characteristics: marginal territory that remains an interstice between the overpopulated and rich plateaus of Mexico's central highlands and the industry, commerce, and intensive and technical agriculture of the Veracruz State lowlands. Fragilities, deficiencies and limitations that endure through time and have a great effect on the degree of vulnerability have high correlations on the regional scale. However, to understand the complexity of vulnerability, the scope must change to the local scale; at this scale, the history of the environmental exploitation and the cultural, economic and political priorities of the territorial organization indicate the way vulnerability has arisen and what combination of social weaknesses has prevailed in the face of a possible threat. Historical analysis seeks to identify by means of bibliographic, primary or landscape sources the initial condition in time and space of a community and the main causes of the present vulnerability; these are social, economic and environmental factors that in a marginal region, like the one described here, show their most rapacious aspects by means of political control, low wages and ideological subjection. Every element in vulnerability has its own pace for change or mitigation in the face of disaster. The above discussion proposes the viability of a retrospective analysis of what vulnerability represents: a socioeconomic, political and cultural process that creates vulnerability through changes in territorial hierarchies, urban development and material culture. Pahuatlán's community history is very old, as is that of all the political units that for centuries controlled from the highest summits of the Eastern Sierra Madre the commercial routes between the Mexican Central Highlands and the Gulf coast lowlands. A longterm perspective of management of environmental and sociopolitical subdivisions in Metztitlan, 80 km NW of Pahuatlán (Fernández et al., 2006:479480) regards the main rivers that descend from the ‘sierra' as territorial arteries; the control of the upper basin of the San Marcos river may help explain the origin and importance of Pahuatlán communities before the arrival of the Spaniards. The Aztec and their allies had made of Pahuatlán a tributary province by the mid 15th century. Early colonial sources are not entirely clear, and do not define with adequate precision the hierarchy and structure of Pahuatlán's settlements; it is believed to have been a political unit with twin administrative centers, a very common political and territorial situation in Mesoamerica. These centers are represented by the present villages of Atla and Xolotla, both located on a limestone mountain facing the villa and separated from it by the ravine of the Trinidad river. This emplacement afforded a degree of defense in case of an invasion from the highlands. According to Gerhard (1986:119) the two Aztec garrisons of Atlan and Tezapotitlan controled the large ‘province' of Guachinango (Huauchinango), which had a territory that extended from the northern half of the Sierra Norte de Puebla as far as the Gulf lowlands between the San Marcos or Cazones river and the Tamiahua estuary. The three most important towns in this province were Huauchinango, Xicotepec and Pahuatlán, all ruled by Texcocan nobles, the most important allies of the Aztecs. Among the provinces that paid tribute to the tripartite confederation headed by the Aztecs was Atlan, situated at the low northernmost part of Puebla State some fifty kilometers to the northeast of the Pahuatlán area; it is likely that this province was named after the strategic Atla stronghold. It was no easy task for the conquistadors to understand the landscape or the organization and distribution of urban features, particularly when they tried to rationalize the placement of political units in the mountainous areas. In Pahuatlán's case, the strategic advantage of the AtlaXolotla mountain for economic and military purposes was not useful for the Spanish and they gave precedence to the establishment of a settlement that would have easier communication with Mexico City and the highlands.2 Hence, a new emplacement was selected as the political, tributary and religious center, a choice that lacked the foresight and practical knowledge required for management of these mountains. The imposition of this change, with the creation of a new town, was the first step in a process that has led to the vulnerability of today's Pahuatlán villa. Most of the eastern Sierra Madre held no interest for the Spanish, and steep and torrid Pahuatlán was no exception in this general marginalization and dismissal. Things began to change in the 1850s, at first with jurisdictional and territorial amendments and later with changes in land use as a consequence of the introduction of new crops for distant markets. A study of Mexico City (Garza, 2006:111) explained the effects of adopting political and economic principles that put a commercial value on land, to the detriment of indigenous and religious communities, as a precedent of territorial and landscape changes. In the case examined here, Pahuatlán villa3 was one of the entities consolidated by Mexican Liberalism in the mid 19th century, when new political and territorial hierarchies were created: Indian communities were disadvantaged and the only people communicating with outside authorities were the mestizo or criollo mayors. As soon as Pahuatlán attained the villa status, it ascended in the complicated territorial organization that Mexico had before the 1910 revolution; in the lists of districts of Puebla State, the Huauchinango district appears as "Huauchinango and Pahuatlán" in 1868, 1871, 1877 and 1882 (AGEP, Colección de Decretos). Such recognition could have been a political measure, in order to integrate Pahuatlán into the aforementioned state, because of the political and territorial problems stemming from the creation of Hidalgo State by the imposition of more precise boundaries in the illdefined and remote area between the States of Mexico and Puebla (Figure 1). Territorial adjustments continued, but during the years of Porfirio Díaz's dictatorship (18761880, 18841911) these were accompanied by major changes in the landscape. Whereas the new territorial hierarchies of Liberalism were recorded on paper, the socioeconomic and cultural changes left their mark on the landscape: the coming of the railway, at first to Tulancingo (1893) and later as far as Honey (1908), made the cultivation of tropical products very profitable for this area. Pahuatlán became a major supplier of the markets of Mexico City, Pachuca and Tulancingo. Tulancingo had for centuries taken advantage of its location on the eastern fringe of the highlands, and among the products it valued were the ‘tropical' vegetables and fruits from Pahuatlán, but the coming of the railway increased by far such commercial exchange and even contributed to the creation of a new municipality on the highest part of Pahuatlán: HoneyChila. Agricultural practice grew in area and intensity, mainly with the cultivation of sugar cane4 and maize, and with coffee production beginning to assume importance in the Sierra Norte de Puebla in the closing stages of the Porfirio Díaz regime (Velásquez, 1995:55). Hence, the modest hamlet surrounding its old church that was Pahuatlán villa at the beginning of the 1860s, fifty years later became a hectic urban nucleus that concentrated products from the high and mid Cazones river basin and marketed what the villa and the Indian communities required. The first substantial houses were built of traditional materials, mostly adobe and wood and a few of brick or stone. However, the prestigious larger housing and the eventual use of ‘modern' materials transformed housing throughout the 20th century; many still retain their traditional facades, but inside floors or rooms have been added or heavier architectural elements have been used. Also, the construction of schools and hospitals has added weight to the unstable terrace that supports the villa's center. Currently, several blocks of the villa are affected by slope instability expressed in the occurrence of landslides. This section has dealt thus far with the urban and territorial evolution of Pahuatlán villa, its development and consolidation as an urban nucleus and the changes to its urban morphology. Before a detailed consideration of the disasters to which this area is prone, the relevant physical and biological characteristics will here be summarized. The deep ravines and high summits that characterize the Pahuatlán area are primarily the result of the eastern Sierra Madre orogenesis, although the highest and westernmost sections are part of the Transmexican Volcanic Belt. There are steep slopes, but it is the lithology and structure that is in large measure responsible for the landslides to which this landscape is subject. The area studied is mostly configured by different Mesozoic rocks. Significant among them are the following: an arrhythmic sequence of conglomerates and shales of the Huayacocotla formation (Lower Jurassic); conglomerates and siltstones (Mid Jurassic) of the Cahuasas formation; limestones of the Tepexic formation; shales and siltstones of the Santiago formation, shales and limestones of the Tamán formation, and limestones and shales of the Pimienta formation (all Upper Jurassic); and limestones and shales of the Tamaulipas formation (Cretaceous). 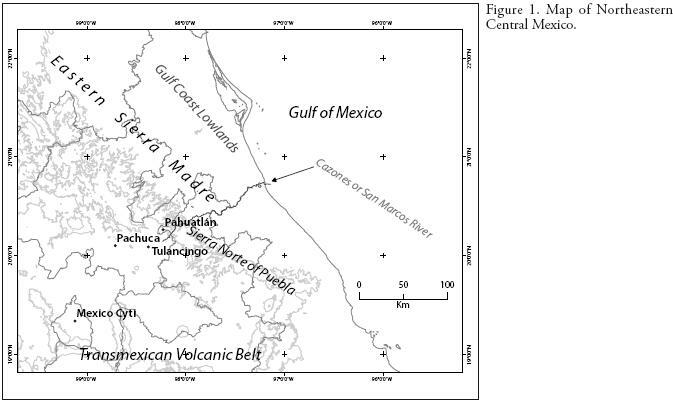 To a lesser extent there are Cenozoic rocks: igneous (basalt and andesite) from the Tertiary and alluvium from the Quaternary next to the San Marcos or Cazones river (Figure 2). All the rocks in this area have been altered by various geotectonic processes that have built a muchfractured relief. In the vicinity of Pahuatlán villa, local metamorphism has made shale crumbly and silky, resulting in a very susceptible terrain often affected by mass movements; mountainous relief is characterized by a constant surface modeling based on seeking the equilibrium between the elevated areas and the flat lands, with slope stability being a main issue of such balance. Therefore, irregular morphology is quite common at the local scale; among the main summits of the area are Chile, Toxtla, Blanco, Tlazalotepec, La Cruz and Batalla del 28 de Enero. Rainfall is abundant here, as it is over all the oceanfacing slopes of the central and southern parts of the eastern Sierra Madre, but the orientation of the high and mid Cazones river basin, together with the strong variation in altitude and the proximity to the highlands, are additional factors contributing to the saturation of Pahuatlán's soils through most of the year. When hurricanes hit this part of the Gulf coast, the effects are usually catastrophic, since they occur mainly at the end of the rainy season (JuneNovember), when soils are waterlogged. The mean precipitation ranges from 2000 to 2500 millimeters per year. Precipitation is low during winter owing to ‘nortes' (polar air masses that collide with the warm waters of the Gulf of Mexico and provoke highspeed winds and usually light rainfall). Given the lack of detailed meteorological records for Pahuatlán (available for only a few years, all climatic tendencies or patterns are usually inferred through the information derived from Huauchinango, Necaxa and Huayacocotla meteorological stations, and therefore the hydrometeorological particularities of the studied area are not well defined. Deforestation (of the mesophyll woods, or the pine and oak woods), agricultural use of steep slopes, road building and quarrying (in many cases unregulated) are practices that, outside the urban zones, predispose the terrain to potential threats. 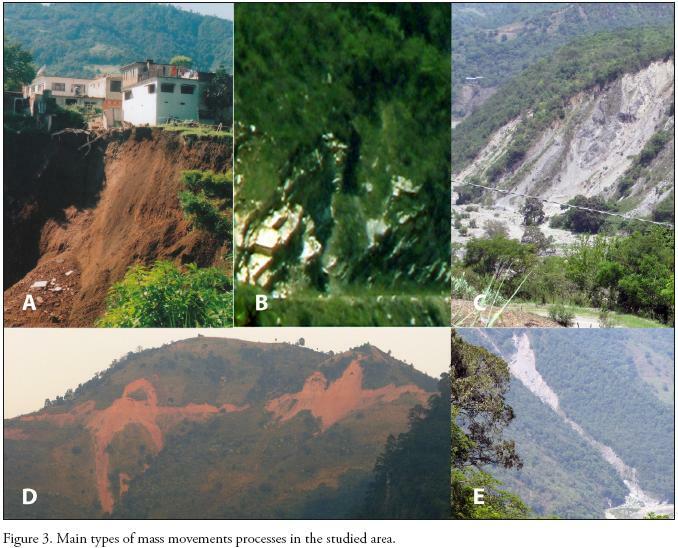 The main types of mass movements in the area are flows, falls, landslides and complex movements (Alcántara, 2004b; Figure 3). High susceptibility of the Pahuatlán terrain is determined by the low strength of the lithological elements of hillslope materials, weaknesses associated with a complex tectonic evolution and with naturally steep terrains. Furthermore, erosive and accumulative processes are of considerable influence on the relief dynamic, which is also affected by human activity through the geometrical modification of slopes because of quallying or the construction of embankments. The natural mechanisms of slope instability are usually seismicity, volcanic activity and rainfall, but nowadays in the Pahuatlán area the only mechanism that leads to mass movements is rainfall; this may be highfrequency and lowmagnitude rainfall that occurs for several hours or even days, or lowfrequency and highmagnitude rainfall due to extraordinary storms or provoked by larger systems such as tropical storms and/or hurricanes. Another factor of great importance for slope instability is deforestation. Since the 1950s, high rates of deforestation in the studied area have been caused mainly by quarrying, a large production of amate paper5 and the lower prices for agricultural products, particularly coffee. Because of this, even when there are no precise studies of slope instability caused by deforestation, it is important to consider the socioeconomic conditions of poorly regulated forest exploitation. 1. Pahuatlán's villa is located over an ancient landslide that predates the colonial settlement. No information has been traced regarding landslides that occurred earlier than the 20th century. 2. The first reports on the reactivation of landslide processes come from 1955. Mass media and rain gauges recorded this as a very rainy year in which cyclone Janet took place (Alcántara, 2004b); landslides occurred in the northeastern part of the villa and a long crackfissure a clear expression of instability appeared on the main street. The fissure was eventually covered with stone and cement by the inhabitants. 3. In 1989, intense rainfall caused several landslides; again the northeastern part was the most affected, with several houses and roads being damaged. 4. 1995 was also a very rainy year, reactivating the landslide in the northeast sector; tonnes of earth moved and several buildings were damaged. 5. In the autumn of 1999, conditions were severe for the whole of the Sierra Norte de Puebla as a result of intense rainfall (Alcántara, 2004b; Alcántara et al., 2004; Borja and Alcántara, 2004, Lugo et al., 2005; Alcántara et al., 2006; Borja et al., 2006; Hernández et al., 2007). In the municipality of Pahuatlán the landslide was reactivated and several people died, and many houses and some public buildings were completely or partially destroyed. 6. In September 2001, a landslide occurred at the site of the municipal hospital, and construction of a nearby housing project and a sports center had to be suspended. The cracks in the hospital building remain to this day. 7. In 2005, rains on the Sierra again were heavy, and one of the most important commercial streets of the villa was affected by the instability of the steep terrain; most of the houses and shops on the eastern side of 5 de Mayo Street were damaged. 8. 2007 is the most recent year for which heavy and persistent rainfall has been recorded and there were also two hurricanes (Dean and Lorenzo); landslides occurred throughout the municipality and some of its localities were isolated for several days. Hence, the incidence of landslides has grown during the late 20th and early 21st centuries; the frequent heavy rains have been the catalyst but not the underlying cause. Viewed from a longer perspective, the fundamental determinants have been the place selected for the Pahuatlán villa back in the 16th century and the building materials used after the 1950s. These two factors, the change of settlement patterns after the Spanish conquest and changes in material culture, are common throughout these mountains. Within the Pahuatlán municipality, the San Pablito township is also at high risk, because of the unstable ground used for urban purposes during recent decades; this settlement has grown constantly since the 1970s, when its inhabitants started to sell, nationally and internationally, their amate paper products. This activity has polluted the town streams and the Cazones river, and has also made of San Pablito the second largest community within the Pahuatlán municipality. Also, economic resources derived from emigration, mainly to the USA, have been used to achieve better housing that no longer uses traditional building materials. All this has resulted in the addition of excessive weight to the fragile and unstable shale mountainside of San Pablito. In Pahuatlán, the changes in its spatial and territorial hierarchies, urban processes and material culture are all physical manifestations of human concerns. However, all these aspects are constantly infused with ideological and economic models agreed with, or imposed by, political bodies. Consideration of specific physical aspects of Pahuatlán villa has shown the development of the vulnerability that has afflicted the municipality since the mid 20th century. However, consideration of the prevailing political system and economic model reveals similar problems on a regional scale. These are common to the whole of the Sierra Norte de Puebla: a decrease in productivity through low profits for crops (almost all the Sierra's landholdings are small and lack technology, and because of this they are unable to compete with other regions), inefficient education and health systems, changes in cultural schemes and the fragmentation of communities due to political or religious bias or as consequence of emigration. This is a crucial issue in the demography of the Sierra. Until the 1980s, emigration was to other parts of the country: mainly to Mexico City or Puebla City or the Veracruz State lowlands. More recently, most emigrants have left for the USA, and this leads to a greater disintegration of the social fabric. This impedes the creation of an adequate diagnosis, since strategies for community participation and the analysis of risk perception are crucial in decreasing risks and the underlying vulnerability (Alcántara, 2004a). The study of vulnerability through the temporal evolution of priorities in space and territory is useful, because it leads to the identification of social and environmental conditions that generate risk; complex and integral analysis detects circumstances beyond the more precise needs, bringing into discussion the original and systemic factors that lead to vulnerability. Also, this type of analysis allows action directed at the most vulnerable groups within the population and adjusted to the specific causes of their vulnerability. It is essential for evaluating the gravity and prognosis of the situation, thereby leading to timely action. Another advantage of this type of approach is its understanding of economic capacities and cultural, political and social organization forms; this allows assessment, even before a disaster occurs, of the ability to respond to it and to survive it with less human and material damage or even to avoid it in the future. The studied case shows high and mid income groups (commercial activity, amate paper production or successful migration are the main vehicles of economic growth in the studied area) as those living at the most vulnerable places from an structural point of view. Owing to social status or the commercial activity, more weight has been added to dwellings on the shale slopes. Even without precise data for the weight added during the past five decades, the heterogeneous and random building of additional floors or rooms shows the contradictions of urban patterns characterized by improvisation and disregard over high steep slopes and highly susceptible geological materials. In this case, vulnerability affects social groups with top economic and political capacities, people who are not usually considered as the most vulnerable to disasters. When investigating change and inertia in space and territory over the medium and long terms, the wider regional character of this type of research cannot be denied; there are similarities in physical, biological and human terms in the ways environment is used, in the allocation of land, and in territorial administration. Hence, although we have focused on the case of Pahuatlán villa, our conclusions are probably applicable to most of the Sierra Norte de Puebla. So far in this region, because of the magnitude of the disasters, a reiterative intervention of government agencies has taken place, but these official endeavors have consisted only of reactive, isolated and specific measures. Preventive measures, if any, are not related to social needs. Finally, it is important to insist on prevention and mitigation measures, understood as a historical process, in which the behavior and inertia of socioeconomic, political and cultural patterns may indicate ways to reverse the signs of vulnerability to disaster. These prevention strategies must be linked to the social and cultural needs of the population, in order to achieve feasible mitigation measures. Temporal analysis for preventive purposes must be conducted through constant monitoring that has as its priority the recording of physical, biological and human changes. These markers under optimal conditions should lead to a population less exposed to risks and therefore to the occurrence of a disaster. We acknowledge the Consejo Nacional de Ciencia y Tecnología (CONACyT) for the granting of research project 49844, which aims to prevent disasters linked to unstable slopes. We are also grateful to Ricardo Javier Garnica Peña for constant help in field work. Archivo General del Estado de Puebla (AGEP), Colección de Decretos 1859A, 25IX1861. AGEP, Colección de decretos del Congreso general y órdenes del Supremo Gobierno, 1837, 27V1837. AGEP, Colección de Decretos 1868: 26 de junio; 1871: 6 de junio; 1877: 21 de enero y 1882: 6 de junio. AGEP, Colección de Decretos 1895: 8X1895; 1894: 8X1894; 1893: 27X1893; 1890: 29X1890; 1889: 18X1889; 1887: 20VII1887 y 17X1887. Lavell, A. (2001), Gestión de Riesgos Ambientales Urbanos, Facultad Latinoamericana de Ciencias Sociales y La Red de Estudios Sociales en Prevención de Desastres en América Latina, Bogotá [ Links ]. Oliver Smith, A. (1994), "Reconstrucción después del desastre: una visión general de secuelas y problemas", in Lavell, A. (comp. ), Al norte del Río Grande, Ciencias Sociales, Desastres: una perspectiva norteamericana, La Red and ITDG, Tercer Mundo Editores, Bogotá [ Links ]. Quarantelli, E. L. (1996), Desastres y catástrofes: condiciones y consecuencias para el desarrollo social, in Lavell, A. (comp. ), Al norte del Río Grande, Ciencias Sociales, Desastres: una perspectiva norteamericana, La Red and ITDG, Tercer Mundo Editores, Bogotá [ Links ]. Sanahuja Rodríguez, H. E. (2001), El daño y la evaluación del riesgo en América Central, Departamento de GeografíaUniversidad de Costa Rica, San José [ Links ]. 1 Villa is the urban category given to certain small cities throughout Mexico, usually municipal seats or regional centers. 2 The importance of Atla and Xolotla, during the 16th and 17th centuries, when they were independent of Pahuatlán and directly administered by Huauchinango, is also documented by Gerhard (op. cit.:122). The Spanish did not recognize the complexity and autonomy of the urbanterritorial components of this ancient cityState and split it up. Also, José Montoya (1964:14) confirms in an ethnographic work that Atla and Xolotla were larger than Pahuatlán, and that today´s villa was a mere hamlet by the early 19th century. 3 Pahuatlán del valle (AGEP, decretos 1859A: 25IX1861) was the full name given to the villaje of Pahuatlán when it became a villa, in honor of the liberal hero Leandro Valle; nowadays, it is known as Pahuatlán de Valle. 4 Among the Districts of Puebla State, Huauchinango was the second most important sugar producer throughout the 1880s (AGEP, decretos 1895: 8X1895, 1894: 8X1894, 1893: 27X1893, 1890: 29X1890, 1889: 18X1889, 1887: 20VII1887 y 17X1887). Sugar cane growing was one of the main activities in Pahuatlán from the end of the nineteenth century to the mid twentieth century. This information comes from oral tradition and from Montoya´s ethnographic work (1964:3874). 5 Amate paper, produced from inner bark of trees, was the most common paper before the Spaniards arrived in Mesoamerica and is still produced as a handicraft.